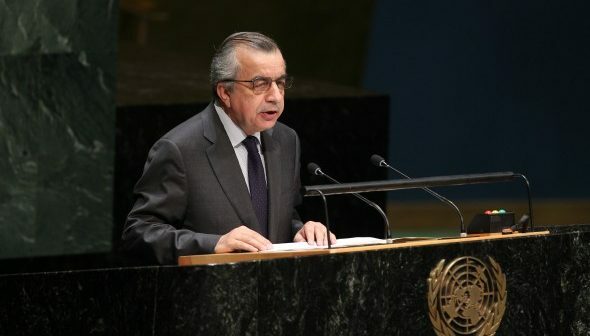 General Assembly Considers Situation in Afghanistan H.E. 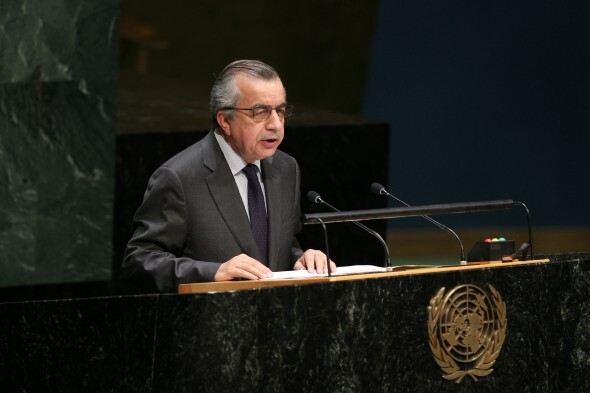 Zahir Tanin, Permanent Representative of Afghanistan to the UN, addresses the General Assembly meeting on the situation in Afghanistan. Thank you, Mr. President. As we come together to adopt this year’s General Assembly Resolution on the Situation in Afghanistan, I would like to thank all Member States that participated in the negotiation of the resolution. I would also like to thank Ambassador Braun, Ambassador Thoms and their teams, particularly Daniel Schemske, at the Permanent Mission of Germany to the United Nations for their hard work facilitating the negotiations. At the end of this year, the government of Afghanistan will take full responsibility for the security of the country. The mandate of the International Security Assistance Force (ISAF), authorized by the Security Council under Chapter VII of the United Nations Charter, is set to expire on December 31st and Afghanistan will move towards a more normalized international status as a sovereign nation. We have been striving for this moment for the last decade. It is a major accomplishment and an important step towards achieving a peaceful, sovereign and prosperous Afghanistan. While the NATO combat role will end, Afghanistan and NATO remain committed to a long-term strategic partnership. NATO will continue to train, advise and assist the Afghan National Defense and Security Forces (ANDSF) beyond 2014 through the Resolute Support Mission (RSM) on the basis of the NATO-Afghanistan Status of Forces Agreement (SOFA) and the United States of America-Afghanistan Security and Defense Cooperation Agreement (BSA). We welcome the General Assembly’s message of support for the new mission. I also would like to take this opportunity to express my government’s profound gratitude to all those international civilian and military men and women who served shoulder to shoulder with their Afghan partners towards a better future for the people of Afghanistan. The Afghan people will always remember and honor their sacrifice and dedication. Afghanistan has emerged from an historic election that marked the first democratic transfer of power from one president to the next, an important milestone in Afghanistan’s multifaceted transition. While the challenges that arose in the election period tested our resolve, the wisdom of the country’s leadership and the support of its friends and partners allowed us to overcome the difficulties and move towards a unified, peaceful, democratic and prosperous future. 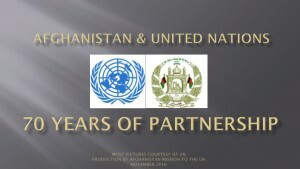 The establishment of a government of national unity has generated an atmosphere of broader political inclusivity and participation; it will enable Afghans from all walks of life to contribute to the economic and social development of the country, the sustainability of the Afghan state and its security forces and the peace and security of Afghanistan and the wider region. 1. Eliminating corruption. Corruption corrodes state effectiveness, security, public faith in government and progress towards peace and prosperity. It feeds insurgency, patronage and illegal interests. Tackling corruption is paramount to the government’s reform agenda. In his inaugural address, President Ghani stressed his zero-tolerance policy in regards to corruption, and as soon as he assumed the Presidency, he ordered the Supreme Court to reopen an inquiry into the Kabul Bank fraud case. Since then, the court has sentenced the bank’s executives to 15 years in prison, ordered the payment of substantial fines, and froze the assets of those accused of corruption. Other suspects will now be investigated for their involvement in the $900 million embezzlement scandal. This courageous step demonstrates the government’s firm commitment to eradicate corruption and end impunity. 2. Enhancing democratic accountability, governance and rule of law. Afghanistan’s leadership is in the process of establishing a functional, merit-based cabinet as part of its wider commitment to build effective governance at every level. In addition, we will reform electoral institutions, electoral processes and relevant laws as well as necessary amendments of the constitution. The government will also focus on reforming the judiciary and all law enforcement institutions, including by taking concrete actions to expand access to justice and uphold the rights of all Afghan citizens, particularly women and girls. I would like to call attention to the government’s recent adoption of the Afghanistan National Action Plan for women, peace and security, which represents an important step in this regard. 3. Promoting economic growth and social development. The national unity government is committed to economic reforms that stimulate growth and tackle poverty, inequality, and unemployment. These include strengthening cooperation between the government and the private sector, removing obstacles to investment and trade, promoting sustainable livelihoods, reinvigorating counter-narcotics efforts, and using aid effectively to reinforce development and stability. Continuing implementation of the Tokyo Mutual Accountability Framework remains central to these efforts and we look forward to the next ministerial meeting on Afghanistan to be held in London next month. I would like to take this opportunity to thank the United Kingdom for hosting this important meeting. The Afghan people have been victims of terrorism and violence for almost 40 years. The violence perpetrated by terrorists, extremists and illegal armed groups continues to have daily, devastating impacts on all civilians, particularly women and children and poses the greatest obstacle to political, economic, and social progress in Afghanistan. The Afghan National Defense and Security Forces (ANDSF) continue to demonstrate professionalism and courage in protecting the Afghan people. Moving forward, the national unity government will work tirelessly to continue to strengthen the capacity of the Afghan National Defense and Security Forces (ANDSF) to uphold the security of the nation, and to preserve the achievements of the last decade. The continuing support of our international partners, namely through the new NATO mission, is crucial to the success of these efforts. But Mr. President, the country will not achieve peace through military efforts alone. President Ghani has called on all armed opponents of the government to enter political talks and play their part in building a strong and successful Afghanistan. The government of Afghanistan is working to establish a wider inclusive political framework for lasting peace including a new outreach to the armed opposition and national reconciliation. This is an Afghan-led and Afghan-owned process, but at the same time we recognize the important role of regional and neighboring countries, particularly the Islamic Republic of Pakistan, in contributing to our efforts to end the conflict. President Ghani initiated serious efforts to further a political settlement during his recent visits to Saudi Arabia, China and Pakistan and his meetings and conversations with the leaders of neighboring, regional and partner countries. Regional cooperation is not only key to peace and security but also to prosperity in Afghanistan and the wider region. 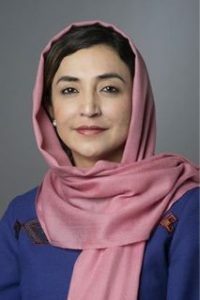 In this connection, the government of Afghanistan is committed to deepening cooperation with its neighbors and regional partners. Last week President Ghani paid an historic visit to the Islamic Republic of Pakistan, where the leaders of the two countries opened a friendly, forward-looking dialogue and made concrete agreements related to improving bilateral economic, trade and investment relations. The visit generated an unprecedented surge of optimism and set the groundwork for long-term cooperation between the two nations. In October, President Ghani conducted another historic state visit to the People’s Republic of China, where bold steps were taken towards increasing cooperation in economic development and stabilization efforts. The visit coincided with the annual Heart of Asia Ministerial Conference on 31 October, which reaffirmed commitments to strengthen regional security and cooperation for a secure and stable Afghanistan. We are grateful to the government of China for its leadership and for hosting the meeting and thank the Islamic Republic of Pakistan for hosting the next Ministerial Meeting of the Istanbul Process in 2015. The president of Afghanistan looks forward to furthering regional engagement by attending the upcoming South Asian Association of Regional Cooperation (SAARC) summit at the end of this month in Kathmandu. Deepening regional cooperation will open the doors to a flourishing continental economy in the heart of Asia. Afghanistan has great potential to enhance the development and prosperity of the entire region by unlocking the country’s capacity to serve as a hub for connectivity and trade across Asia. This will entail key energy and power projects such as the Turkmenistan–Afghanistan– Pakistan–India Pipeline (TAPI) and the Central Asia South Asia Electricity Transmission and Trade Project (CASA 1000) as well as the building of a wide regional transport network including railways and highways. All regional partners can play a role through working together and engaging chambers of commerce and business communities for a joint and coordinated action to turn potential into reality. As the new government focuses on a renewed regional cooperation, our long-term partnerships with the wider international community remain the backbone of our efforts for peace, security, stability and prosperity in Afghanistan. The support of the international community has allowed us to build a new Afghanistan and will continue to be crucial in the transformation decade ahead. The President’s upcoming visit to the London conference and his upcoming visit to the United States will be an important step in furthering our mutual cooperation and partnership with the international community. The past 13 years have seen the international community’s unprecedented engagement in supporting the government of Afghanistan in its efforts to build peace and stability. While the goals set over a decade ago have not been fully realized, Afghanistan is determined to bring sustainable peace, security and prosperity to the country with the support of our international partners. The government of Afghanistan’s ambitious agenda of reform, the collaboration of all Afghan political forces, and the support of the Afghan people will enable us to put an end to the destructive narrative of toxic extremism and reach the beginning of an era of peace. In doing so, we will change the course of history in the heart of Asia, to the great benefit of our people, our neighbors, the wider region, and the international community.